A choose your own ending novel! Choose from over 30 different endings! When Sam Manetta learns that the legendary Crest Hill Insane Asylum will be torn down to build a new mall, he realizes that tonight is his last chance to explore the abandoned psych ward. It’s supposedly so scary that only three kids have ever snuck into it, and they were seniors in high school. Sam is determined to become the fourth and youngest. He knows that if he can explore the building and bring something back with him as evidence, he will become more popular at Crest Hill Middle School. So he’s not alone, he gets his three friends to join him: Johnny, a goofy scardy cat; Billy, a stocky kid on the football team; and Karen, the beautiful girl who he has a secret crush on. Will Sam find what he’s looking for, will he get to confess his true feelings to Karen, or will he and his friends stumble upon a truckload of terror? The choice is yours. Help Sam and his friends navigate the abandoned asylum. Go up or down the stairs, turn right, turn left, read what looks to be a creepy spell, search in different objects, and much more! Links are provided for you to return to your last choice so you, Sam, and his friends can explore the entire asylum. One last thing: It’s Halloween night. Will that make matters worse? 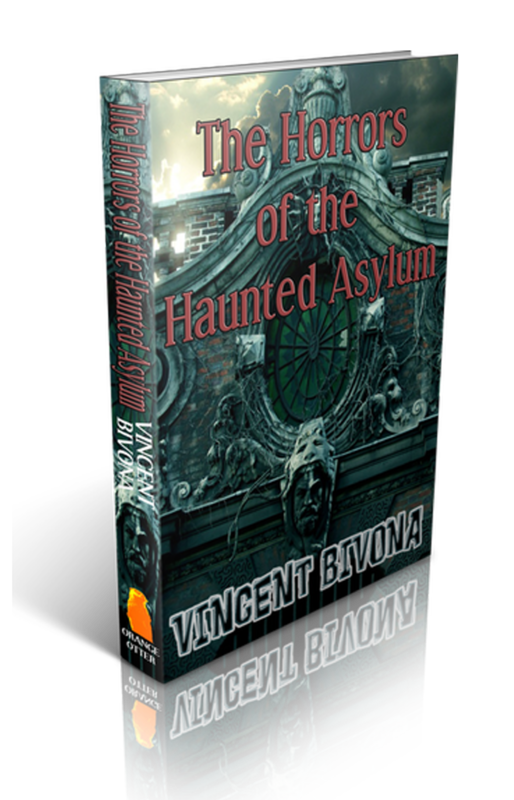 Will it stir up ghosts and spirits and cause all sorts of ghoulish creatures to creep about the asylum? Read on to find out . . .
Before Sam Manetta and his friends snuck into the abandoned Crest Hill Insane Asylum, before the ageless haunted tomb unleashed all its ghoulish entities, Sam saw it on the television. A reporter clutching a microphone with the Channel 7 News logo on it stood center screen. She had bright blue eyes and long blonde hair that was pulled back so tight there wasn’t a single wrinkle on her forehead. The lady didn’t interest Sam in the slightest. It was the building behind her that did: a massive dark marvel of architecture with an innumerable amount of broken windows rising out of the ground like a monstrous tombstone. “Even though the Crest Hill Insane Asylum has been closed for over seventy years,” the reporter announced, “it can still be remembered for treatments that would seem unethical today, such as ‘trepanning,’ ‘bloodletting,’ and prescribing mercury to cure ailments. It was even here that the first lobotomy in the United States was performed. His classmates wouldn’t think anything, he reasoned, because now some stupid contractor was going to tear down the asylum and build a lame mall. All at once, his dreams of being well-liked and admired came crashing down. Now he would just be regular, boring Sam Manetta. The grunt his father gave hinted at what he thought of his son’s friends. Sam barely heard it—he was once more thinking that it might not be too late to become popular after all. Sam sprang up at once, dashing to the door. Standing on the other side was two boys his age. The first was a little shorter and stockier than him with a head of blonde hair that was shaved into a crew-cut. He wore face paint and camouflage fatigues—one of the characters from Call of Duty. The second was taller and skinnier. He had glasses and a wig of shaggy brown hair that he tied back with a bandana to keep out of his eyes. His costume consisted of a tie-dyed t-shirt, flip flops, and baggy brown shorts. Karen lived two houses over. She went to the same school and shared most of the same classes. Sam had never told anyone, but he had a secret crush on her. If the situation had been different, Billy and Eddy might have made oooooing sounds and teased Sam for wanting a girl to hang out with them, but Karen had grown up with the boys and was part of their group. That’s why it was so hard for Sam to tell her he liked her—he didn’t know how to. He yearned to ask her out, but the idea of confessing his true feelings was terrifying. She might not like him back, and if that was the case, he didn’t want it to ruin their friendship. Billy and Eddy squeezed their brakes and came to a skidding stop. “Did you say Crest Hill?” Billy asked. “The insane asylum?” Eddy added. “But isn’t it supposed to be haunted?” Eddy asked. “Or worse . . .” Eddy said. Billy and Eddy gave each other uneasy looks. “Come on,” Sam begged. “This is our last chance to do this. After tomorrow, the asylum won’t be there anymore.” He turned hopefully to Billy. CLICK HERE IF EDDY AGREES TO SNEAK INTO THE ABANDONED INSANE ASYLUM. CLICK HERE IF EDDY DECIDES THAT IT’S NOT SUCH A GOOD IDEA.